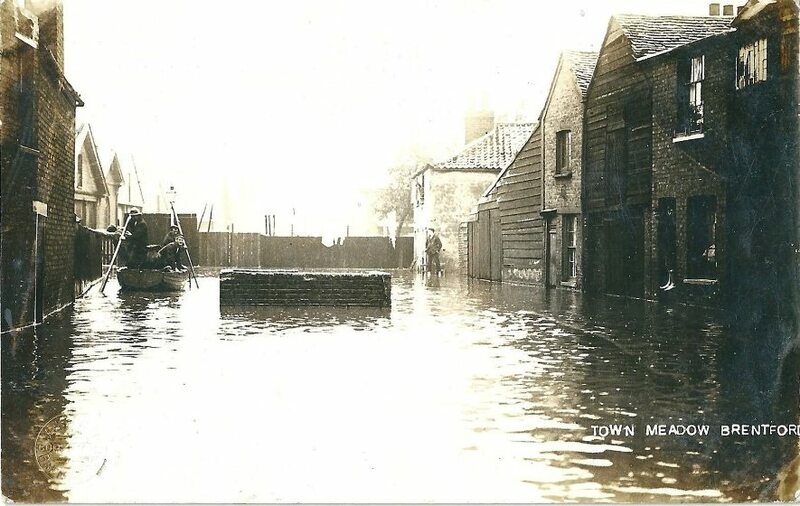 Credits are due to both Peter Stuart and Jim Storrar for sending three unusual postcard images of flooding in Town Meadow Road and Pump Alley, Old Brentford. 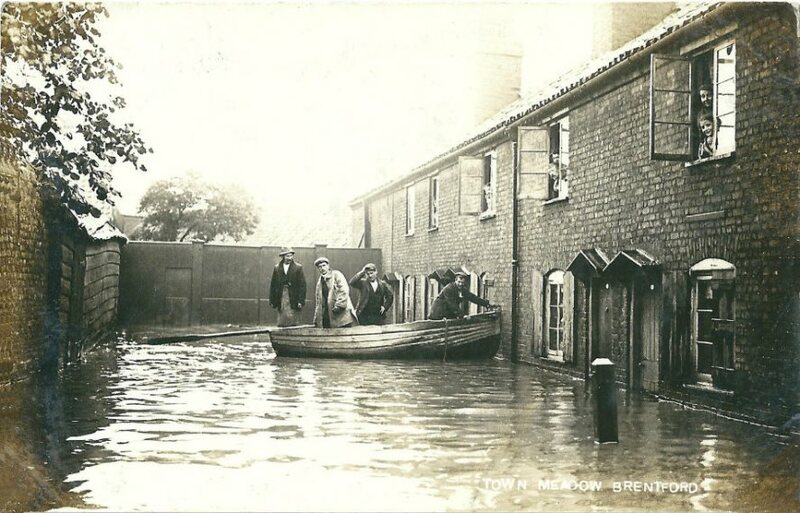 These all feature three or four men in a rowing boat and were taken in Town Meadow Road, which is off the south side of High Street between numbers 60 and 61. 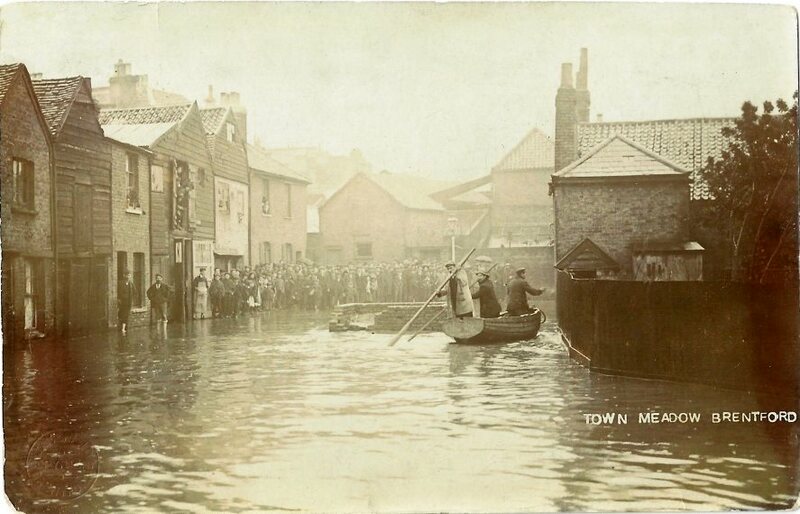 Jim also sent some newspaper accounts from 1906 which he thinks relate to this flood. I am sure he is right; the area affected is around 130 metres north of the Thames highwater mark so would not normally flood and the locations mentioned in the papers tie in too. The account notes 'A service of boats from the adjacent ferry was requisitioned' and the men aboard may have been firemen. 1906 seems to have been a peak point in postcard production and cards featuring traffic jams, floods, demolitions, accidents are on this site as well as many views - see full list. The first has the Wakefield embossed stamp and shows industrial buildings on Town Meadow Road. What is the brick structure I wonder? The second shows five homes with residents marooned upstairs, managing a smile for the camera. This is the clearest view of the men manning the rowing boat. The third has the Wakefield embossed stamp and shows a crowd watching the rescue operation. This photo was taken looking in the opposite direction to the first, the same mysterious brick construction featuring.